Twitch announced via Twitter that Raids have officially been added to all users! 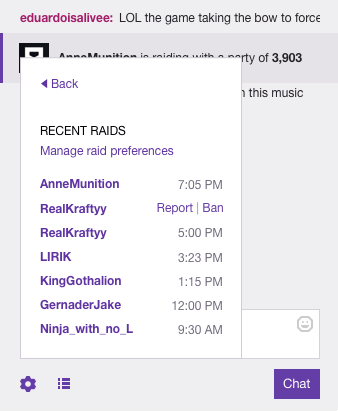 Initially revealed at the TwitchCon 2017 keynote a few weeks ago, Raids are a quick and easy way to send your entire current audience to another streamer’s channel in an instant. Similar to Hosting, Raids are aimed to let your community show another streamer the same passion and support they show you. To start a raid, all you have to do is type “/raid Username” into your chat, with “Username” being the streamer’s Twitch account name. A 30-second timer will begin at the top of your stream’s chat box. From there, your viewers can click the “Join” button next to the timer to be a part of the experience. Once time is up everyone will be instantly transferred as a group to the new streamer’s channel, your channel will automatically host them, and your viewers are free to chat away to show their support! There is a new link under your Options menu in your chatbox where you can see who raided you and when. Click the “See Recent Raids” option to show the dates and times of the raids as well as customizing Raid Options where you can change how often you allow yourself to be raided. You have your choice to allow all streamers to raid you, disable them all, or only allow them from friends, stream teammates, and channels you follow. After testing the feature myself, I can vouch for it and say it is as easy as it looks. As soon as you type the message into your chat to start the raid, it is as simple as pressing a button and everyone is on their way. Hosting is still a feature obviously in case you want to broadcast another streamer on your channel without the fanfare of a Raid notification showing up in their chat as well. Now, you can choose if/how you’d like to make an entrance! 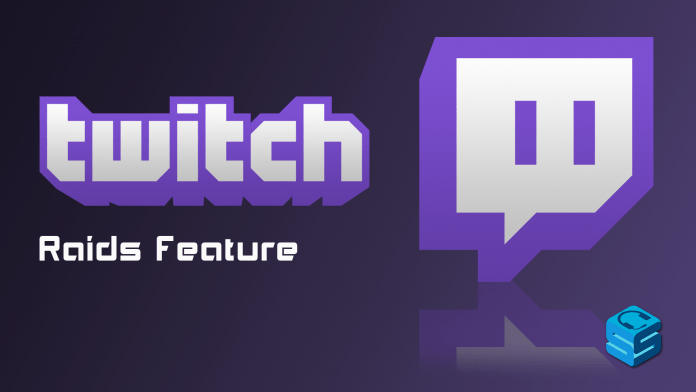 Raids are a great way to not only help another channel grow but to build new relationships and network with other streamers on Twitch which is now easier than ever.